I’m glad to announce we published a new paper titled “Light-growth responses of Sitka spruce, Douglas fir and western hemlock regeneration under continuous cover forestry” on Forest Ecology and Management. We developed predictive models for height and diameter growth that will allow accurate modelling of the study species in continuous cover forestry management. Understanding the light response of natural regeneration is essential for continuous cover forestry. Modelling light-growth requires species-specific non-linear functions. Tree size and intra-regeneration competition can affect the growth rate and the asymptotic growth. An increasing shade tolerance ranking was identified as Douglas fir ≤ Sitka spruce < western hemlock. An apical dominance ratio of 1.5 is an indication of Sitka spruce seedlings with adequate growth. Hemispherical photography (HP) is a wide-spread method for assessing the canopy characteristics and light regime in a forest. In the following paper that we just published on Ecology and Evolution, we evaluated if such method can be carried out with smartphones equipped with (small and cheap) fish-eye lens. The answer: yes! A picture creating by merging two quasi-hemispherical pictures collected with a smartphone camera. the IUFRO 125th Anniversary Congress 2017 in Freiburg has concluded. A great level of participation and presentations, see my contribution to such an event! I am really glad that I have been accepted to present a poster at the massive IUFRO 125th Anniversary Congress! Since the huge number of work submitted to the conference, the competition must have been hard. I will present early height and radial growth models for Sitka spruce, Douglas fir and western hemlock regenerating tree as function of light availability, tree size and intra-regeneration competition. Stay in touch for a preview of my poster here! Before the conference, I will be attending the summer school of the European Dendroecological Fieldweek, hosted in the remote Chalet-Refuge Les Trois Fours, Vosges Mountains, France. I am glad that my research is indeed progressing. 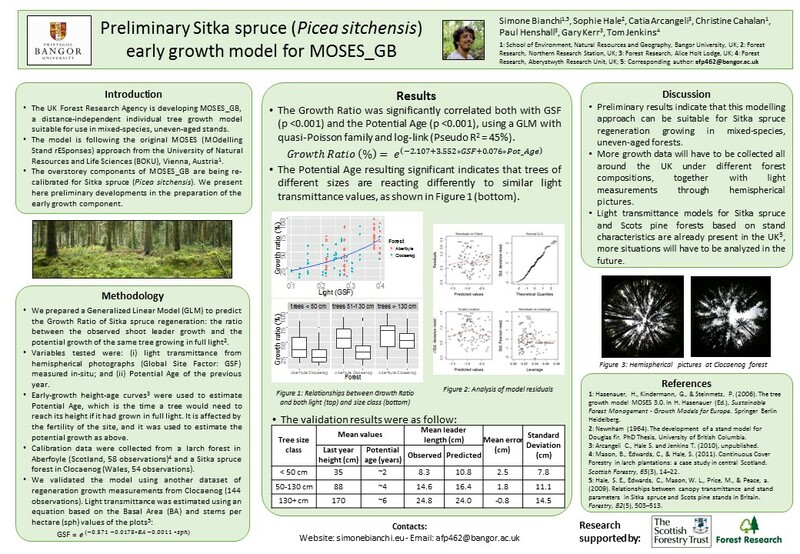 The “take home” message from the poster is: Sitka spruce seedlings growth can be modelled as a function of light measured with hemispherical pictures. Data from very different forests (a larch forest with Sitka spruce regeneration and a pure spruce plantation) were consistent. We considered the growth ratio (the ratio between the observed shoot leader growth and the potential growth of the same tree growing in full light) instead of the absolute leader growth: the results show that we can move forward with this approach! Now it’s time to collect more data! I’ll keep you posted. Did I find it reliable? Did I find it useful for research purposes? Did I find it comparable with professional software/instruments to evaluate canopy characteristics? In a sort of way. More of this to come soon! My advice is to download it and use it in your forest assessments! More feedback to the developers can help to improve it.